I had a fantastic birthday celebration this past weekend with my family! I was out of town for work on my actual birthday, so we chose to postpone the festivities until the weekend. The best present of all was seeing my children after being on the road for five days. We started the birthday fun with pizza and cake on Saturday night. I chose Papa Johns pizza, primarily because their breadsticks are nearly identical to the old Noble Romans breadsticks (my favorite back in the 1980’s). Anyone besides me remember Noble Romans? Then we moved on to the cake. As you can see in the picture below, my kids picked out a Star Trek themed cake. They know me too well! Now the children are competing for playing time with the little Enterprise ship. 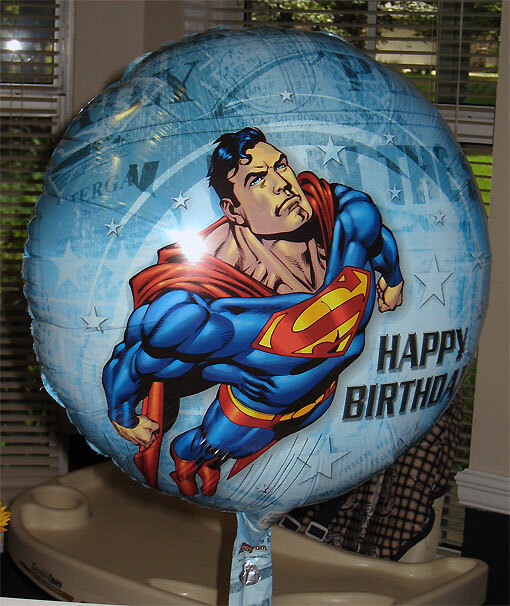 They also scored me a Superman balloon. Sweet kids! Sunday morning we got up early and drove to Wild Adventures theme park. It’s only about 90 minutes away from our house. We chose a trip to the park to celebrate my birthday because this year instead of tangible presents from my family, I asked for a group experience to remember. As I get older, I typically buy the things I want. I’d rather have a precious memory with my family than some DVD or toy. We had a blast at the park! I’d never been there and was surprised by all the great rides they had. There were very few people at the park, so we had the run of the place! Rascal, my nearly ten year old step-son, and I conquered all the major roller coasters right away. While on one called the Boomerang, I found myself questioning our sanity. There were some pretty frightening moments on that coaster. I gotta say Rascal was very brave and a real trooper on those roller coasters. He’s a champ! I also took time for the family-friendly rides with my three year old daughter. She was bubbling over with enthusiasm and excitement. I noticed the park background music was almost all John Williams soundtracks; Jurassic Park, Superman, Star Wars, E.T., Raiders of the Lost Ark, etc. It was a bit odd given that none of the rides were related to those films, but really who cares. It’s awesome riding some monster coaster with the theme to Superman blazing in the speakers! It was a really great birthday that I’ll remember for years to come. Well… at least until I’m really old and the Alzheimer’s kicks in. Belated happy birthday! Sounds like a great one. Sounds like you really did have a great time. I remember seeing the billboards for Wild Adventures when we used to drive through Valdosta on our way to see my wife’s parents in Florida, though I have never been there (she’s not a coaster fan). 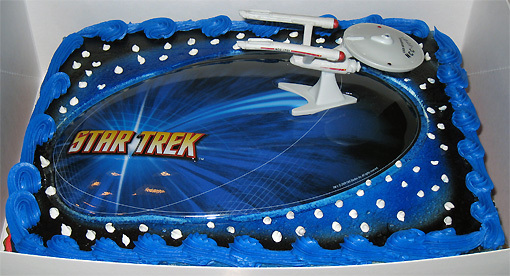 The Star Trek cake is awesome! I wanted an Iron Man cake last year but did not get one, unfortunately. The timeshare which my in-laws have in Orlando has a teeny-tiny Noble Romans pizza on-site, believe it or not. Luke – I didn’t realize they were still in business. After reading your comment I did a Google search. Apparently they’ve got some free standing restaurants and some that share space. I may need to track one down and test out their breadsticks! Happy belated birthday, Shag! That cake rocks.